Republican Attorney General Greg Abbott, who has mostly avoided direct confrontation with his opponent in the race for Texas governor, took a hard swing at Democratic Sen. Wendy Davis over her ethics as a lawmaker in a televised debate Tuesday night. And she let him have it right back. DALLAS — Republican Attorney General Greg Abbott, who has mostly avoided direct confrontation with his opponent in the race for Texas governor, took a hard swing at Democratic Sen. Wendy Davis over her ethics as a lawmaker in a televised debate Tuesday night. And she let him have it right back. While clashing over tax incentives doled out at both the state and local levels, Abbott accused Davis of using her role as a Fort Worth city councilwoman to pad her own pocketbook. Specifically, he said she made money on an economic development deal involving the sporting goods store Cabela’s, because her title company got a piece of the action during a time that she was serving on the council. 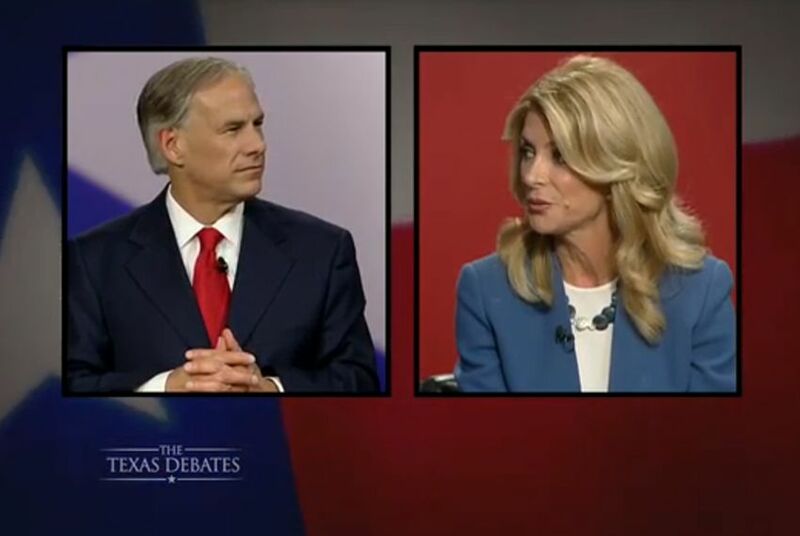 That exchange in the second half of the hour-long discussion was easily the most heated moment the two have shared in either of the two statewide debates, and it represented a far more personal and hands-on attack from Abbott, who has generally left the campaign dirty work to surrogates. He never got to finish his sentence. Davis, in keeping with her aggressive posture from the last debate, cut Abbott off and stopped just short of calling him a liar. “Mr. Abbott, you are not telling the truth right now, and you know you are not telling the truth. I did not personally profit from that,” she said. Then Davis pivoted to the latest controversy involving incentives at the state level — contained in the bruising audit from the state’s deal-closing Texas Enterprise Fund — and revelations that much of the tax subsidies were doled out to companies with little oversight. “You were the chief law enforcement officer over the Enterprise Fund. It was your responsibility to make sure that the tens of millions of dollars that were going to these companies were resulting in jobs, and you failed to do that,” she said. When he was given a rebuttal opportunity, Abbott went back for more. “I would like to respond by knowing how much your title company received by closing the Cabela’s deal that was granted an award from the Texas Enterprise Fund,” Abbott said. Davis said the title company in question, Republic Title, which was run by her husband, “was not my title company.” She said she earned a salary that was “never depending on any deal that ever closed.” Davis finished her remarks by turning the attention back to Abbott and said he should have done more to stop misspending inside the Texas Enterprise Fund. “Mr. Abbott, this is about your failure,” she said. The sparring seemed to overshadow a chunk of news that came toward the end of the debate, when the two candidates were asked about their views on the so-called Texas Dream Act, a law Texas adopted in 2001 that allows certain undocumented immigrants to pay in-state tuition rates while attending public universities in the state. While Davis said she would veto a repeal of the law, Abbott said he would not, which means he is putting some distance between himself and other Republicans like Gov. Rick Perry and state land commissioner hopeful George P. Bush, who want to keep the law. Sen. Dan Patrick, the Republican nominee for lieutenant governor, said during a debate Monday night that the Dream Act should be repealed, and he and other staunch conservative lawmakers are itching to repeal the 2001 law in the next legislative session, which begins in January. Abbott did not immediately answer if he would veto a repeal of the law, but he did respond when one of the panelists pressed him on it. “Would I veto it? No," he said. Also during the debate, Abbott proposed Texas seek and receive a block grant to reform the state’s Medicaid system. It is a proposal similar to the ones Patrick and Perry have laid out for how to deal with the state’s Medicaid system — but Republican leaders in Texas haven't shown they can get approval for it in Washington. “Block grants have been used effectively in states like Rhode Island, Indiana, and I think they can be used now,” Abbott said. Abbott, however, said that Davis’ claims that California and New York were benefiting from Texas not participating in the Affordable Care Act were not true. “If Texas participates, we are making a deal with a federal government that is $18 trillion in debt — that is a bargain I am not willing to make as governor,” Abbott said. Jay Root reported from Dallas, and Bobby Blanchard reported from Austin.